Students in the United States are struggling quite a bit when it comes to their math scores. Only about 40 percent of 4th-grade students perform at a “proficient” level in math, and the same goes for just 34 percent of 8th-grade students. Is your child part of the majority of students who are struggling in math? If so, they might be able to benefit from working with a tutor. How do you know whether or not your child needs a tutor, though? Here are some signs you ought to watch for if you think your child could benefit from a math tutor. One of the most obvious signs that your child needs math tutoring is that their grades are slipping. If your child has always performed well in math in the past but is now having trouble keeping up, tutoring could be a good option. Pay attention to their test scores and check to see if they are beginning to slip. Some schools also make it easy for you to check your child’s grades online. Very few children are eager to sit down and do their homework. But, compare your child’s past behavior to their current behavior. Have they started putting their homework off more than usual? Are they “forgetting” their math assignments or leaving them until the last minute? If this behavior is new for your child, it could be because they’re struggling in math and are dreading dealing with their homework for that particular subject. Did your child once enjoy math? Do they seem to have suddenly lost interest in the subject? If so, that lack of interest might have to do with the fact that they’re having difficulty keeping up. After all, it’s not uncommon for students to not want to participate in a subject they don’t feel they’re good at. In this same vein, your child might also be struggling in math if they’ve stopped talking about their math homework and assignments. Did your child once share a lot of information about the subject with you? Have they stopped talking about it all? If so, maybe they need help getting caught up. Finally, consider whether or not your child’s teacher has expressed concerns about their math performance. Have they sent home notes? Sent emails or called you on the phone? It might be tempting to brush off these concerns. But, denying that your child is having a problem won’t make it go away. It’ll only make things worse. If you have noticed other signs of your child having math problems but haven’t heard from your child’s teacher, you might need to reach out and talk to them yourself. This can be hard to sometimes, but it’s worth it if it will help your child to succeed in school. If you notice any of these signs, there’s a good chance your child could benefit from working with a math tutor. But, you need to make sure you hire the right tutor for your child. Hiring a tutor can make a world of difference to a child who is struggling with math. But, it’s important to be realistic about what the tutor can do. They won’t be able to get your child caught up overnight. Be patient and willing to give the tutor space so they can help your child and work at their own pace. Of course, all tutors are not created equal. Look for a tutor who has received higher-than-average grades in their math courses. Make sure they also have experience tutoring children, specifically children who are the same age as your child. Remember, a tutor who works exclusively with high school students might not be the right fit to help your eight-year-old. One of the best ways to ensure your child is working with a qualified tutor is to sign them up for help at a tutoring service. Tutoring services usually vet their tutors very carefully and make sure they have plenty of experience in a specific field. When you’re looking for a tutor or tutoring service, be sure to compare multiple options before making your decision. Consider the factors that make each tutor or tutoring service great. This includes things like their tutors’ experience level, tutor-to-student ratio, and the tutoring environment. Most tutoring website will have a section that talks up the benefits of their service and it makes comparison easier. Of course, money matters. Before hiring a tutor or tutoring service, be sure to ask about their fees. How much do they charge per session? Is there a cancellation fee? Do you have to sign up for a certain number of tutoring sessions? Finally, find out whether your child can meet with the tutor for a “test run” before you sign up for services. This will help you ensure that your child and the tutor get along well, and you’ll be able to learn more about their specific tutoring style. Do the signs indicate that your child could benefit from a math tutor? If so, it’s important to make sure you hire the right person for them. Keep these tips in mind to make sure you’re hiring a good tutor. 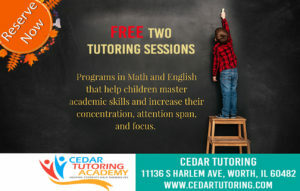 If you live in or around the Worth, Illinois area, we can help at Cedar Tutoring Academy. In addition to math tutoring, we also tutor students in several other subjects, including reading, writing, and even Arabic! Contact us today to learn more about our services or to schedule a free consultation.